We are your source for high quality, hand-crafted Renaissance, Medieval, and Fantasy clothing appropriate for SCA, LARP, Weddings, Renaissance Festivals, Theater and more! Whether you are strolling around the Faire, planning a Medieval wedding, or dancing around the fires at Pennsic War, we create apparel that will take you back through the ages with timeless grace and beauty. In our medieval and renaissance clothing category you will find men and women clothing that has everything from jerkins, tunics and surcoats to bodices, chemises and medieval dresses. We have medieval and renaissance shirts and hats that come in a variety of styles, shapes, sizes and colors. To keep you warm during that cold medieval faire we have medieval cloaks, capes and robes. Finally we have period footwear like leather boots, suede boots and dress shoes to keep your feet warm and to add the final touches to your medieval outfit. Aramis Cape in Black, is a hip length caplet designed for any musketeer or nobleman. Easily wear this cape over one or both shoulders. The rich gold and black trim and open arm slits further embellish this awesome cape. Aramis Cape in Green, is a hip length caplet designed for any musketeer or nobleman. Easily wear this cape over one or both shoulders. The rich gold and black trim and open arm slits further embellish this awesome cape. Benedict Robe is perfect for all of your Medieval, magical, and secret societal needs. 100% textured cotton, the Benedict, is a hooded robe with leather and lace closure at neck. Robe is generously cut and can be closed with a standard belt. Aramis Cape in Red, is a hip length caplet designed for any musketeer or nobleman. Easily wear this cape over one or both shoulders. The rich gold and black trim and open arm slits further embellish this awesome cape. Azog Robe is similar to a medieval monk's robe, that has been aged to appear worn and broken in. Perfect for all of your LARP needs. 100% textured cotton. The Azog is a hooded robe with lace closure at neck, closed with a standard belt. This versatile Celtic cape with collar is equally at home at the Renaissance fair, a night at the Opera or a night on the town! This Black Knight Templar Cloak, with its distinctive red cross, was an instantly recognizable garment in the Crusades era. Our hooded cloak is crafted in black wool with a full linen lining. This Black Medieval Cloak is crafted in a wool blend with a full cotton lining and hood. Work by men and women, this cloak adds warmth and an authentic look to your ensemble. 55 inches long, one size fits most. This Burgundy Medieval Cloak is crafted in a wool blend with a full cotton lining and hood. Work by men and women, this cloak adds warmth and an authentic look to your ensemble. 55 inches long, one size fits most. This Brown Medieval Cloak is crafted in a wool blend with a full cotton lining and hood. Work by men and women, this cloak adds warmth and an authentic look to your ensemble. 55 inches long, one size fits most. Our Child's Noble Cloak allows you to wrap yourself in luxury in our Jewel Black cotton velveteen cloak. The superb cut of this cloak is made even better with tailored shoulders. Capatino Double Mantle Wool Cloak is made of heavy navy wool. Features Nehru collar, and elastic loops and collar buttons for strong closure. Deluxe Renaissance Cape with heavy black 100% cotton fabric has a luxurious lining around the entire front edge and bottom of the generous hood. Sold at By The Sword, Inc.
Deluxe Medieval Cloak provides the finishing touch to your medieval Garb. Heavy black 100% cotton fabric comes with a luxurious lining and generous hood. Deluxe Twill Cloak - Wrap yourself in the comfort of this attractive full length Medieval Cloak with Lined Hood and 2 inch Gold Embroidered Trim. Made from 100% cotton one size fits most. Made in the USA and sold at By The Sword, Inc.
Greek Warrior Cape Get ready to do battle with this classic version of our Greek Cape. Made of tough durable cotton twill, works well with Roman Garb. Sold at By The Sword, Inc.
New Gauze Shawl with Lace, a dramatic versatile shawl in red or black with 4 inch Venice lace. Shawl can be worn around shoulders, tied at hips be worn as a sarong. A fine accessory for Renaissance, Medieval, LARP or Pirate Garb. Our Elizabethan Short Cape, an attractive velveteen cape, is fully lined. Made with collar and neck closure to fasten like classic cape. Can be worn off to one side for the same dashing look seen in Tudor times. Great for men or women. This Hooded Crusader Cape with Red Cross is an off white, cotton cape bears the cross of the Order of Poor Knights Of The Temple of Jerusalem on the left shoulder. Cord closure, one size fits all. Tunic shown is no longer available. The Hospitaller Cloak displays the white Maltese cross on black, signifying that the Hospitaller Knights made the island of Malta their base after the Crusades. Hooded Hospitaller Cloak in pure wool with linen lining. Hooded Crusader Cape - Black with Red Cross. Matches our Medieval Crusader Tunic. Black cotton cape has a red velvet cross stitched to the left forearm area. Decorative leather rondel frog with snap closure and hood completes the cape. Hooded Hospitaller Cape - Black with White Cross. This Medieval Crusader's Hooded Cape matches our Medieval Hospitaler Tunic. This black cotton cape has a white velvet cross stitched to the left forearm area. A decorative leather rondel frog with snap closure in the front and a hood complete the cape. One size. The Eldar Robe is the perfect fantasy jacket to wear to your favorite LARP or Comic-Con convention. Made to be loose fitting, this full length robe can be worn open or closed with a belt. Double stitched for durability excellent for hard action Role Play. This black Don Juan Cape is made in a polyester satin and lined in a deep midnight blue. Long strings for looping under arms and tying behind back for an invisible attachment. Button at the collar for securing to Don Juan Vest. One Size. Elven Embroidered Cloak from cotton twill is an knee-length cape with attached hood and bright Elven embroidered designs. The Cloak is partially lined with contrasting color material. Cloak fastens around the neck by tying the cotton-straps. This faux fox fur mantle is made of polyester and is held in place with a carved bone button and loop. Features a simple drape design. Finished on both sides. This Monk's Robe may be the most versatile and modest garment one could own. Perfect for all of your Medieval, magical, and secret societal needs. 100% cotton, includes robe, hood, and matching waist cord. It wasn't easy finding a traditional Irish Cape that would look just as good at a faire as it does with your regular wardrobe. Whether you're strolling the moors or a night on the town, you'll look terrific in this outstanding Irish cape. This hooded Medieval Hooded Cloak is available in either a short or long version. 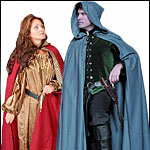 This un-hooded Medieval Cape is available in either a short or long version. This un-hooded Noble's Satin Lined Cape is available in either a short or long version. This hooded Monks Robe is long, lightweight, unlined and is made from a Linen look poly/rayon blend. The Monks Robe Set includes the hooded monks robe and matching surcoat. Be your Lady's knight in shining armour with our Medieval Cloak. Wrap yourself in luxury in our Jewel Black cotton velveteen Noble Cloak. A double layer of cotton twill keeps in the heat while letting out the body's moisture. Our full-length cloak is machine washable. The black is reversible to a Hunter green, Navy, or Burgundy lining. The Medieval Monks Robe Set is our newest version of the popular Monk's Robe with a separate hood and full length robe. This long Knight's Templar cape (for #100936 tunic) is one of the heaviest and most elegant we have ever offered. The stark white color is offset with a large red cross on the left side, while the interior boasts a matching red lining. The cotton velvet fabric keeps the wearer warm, fur at the neck gives an elegant look to this cloak. Drawstring provides an easy and convenient way to close the front. Measures 56" long. This full length, full circle velvet cloak comes complete with a generous hood. A hook and loop mechanism at the neck ensures easy wearing. Measures 56" long. The Knight Templar Cloak, with its distinctive red cross, was an instantly recognizable garment in the Crusades era. Our hooded Templar Cloak in a wool blend comes with a full cotton lining. The Knights Templar Hooded Crusader Cape is made from a white cotton material. Large red velvet Templar Cross on the left shoulder. Leather closure, comes with hood, one size fits all. Medieval Hooded Cloak from cotton twill is an ankle-length cape with attached hood and unique shorter sides. This design offers your arms more freedom of movement. The cloak fastens around the neck by tying the cotton-straps. Medieval LARP Cloak is a light weight ankle-length cape with attached hood. Semi circular design offers more freedom of movement, as the cape is longer in the back than the front. Cloak fastens around the neck by tying the cotton-straps. Medieval Knight's Cloak from cotton is a light weight ankle-length cape with attached hood. This cloak is cut in the traditional full length fashion. Cloak fastens around the neck by tying the cotton-straps. Medieval Knight's Cloak from cotton is a light weight ankle-length cape with attached hood. Worn by Lords and Ladies alike, this cloak is cut in the traditional full length fashion. Cloak fastens around the neck by tying the cotton-straps. Medieval LARP Cape in cotton canvas is a light weight medium length cape with pleated collar. Bellowing shoulders add dimension to your costume, unique design helps prevent your feet from entangling in the cape. Swirled with flair, a Traditional Cape with Hood has provided the finishing touch to an outfit throughout history. This dashing Velvet Long Cape will satisfy the lady or gentleman wanting to project an air of devil-may-care sophistication. Deep in the enchanted forest lives the Snow Queen, ruling over her sparkling domain. She is warmed by her majestic long flowing white faux fur cape. This cape and its hood have a full white satin lining. A silver toned leaf clasp provides a beautiful accent. This one is simply beautiful. Roman Cape: Our large Roman Cape is fully wearable, functional and durable. This full circle Collarless Renaissance Cape was worn by all classes from the Medieval to Renaissance period. Lightweight, unlined and is made from a cotton twill fabric. This hooded Nobles Satin Lined Cloak is available in either a short or long version. This full circle short cape with collar was worn by all classes from the Medieval to Renaissance period. It is midweight, unlined and is made from a single layer 100% Linen. Attaches at the neck. Machine Washable. Made in the USA. Traverse the countryside in our full length durable Travelers Cloak. A double layer of viscose acts to keep in the heat while letting out the body's moisture. This full-length cloak is machine washable and comes with a full hood. Cut in full circle and measures 56" long. One size fits all. Oue Rogue’s Hooded Cape allows you to traverse the towns and alleys in perfect anonymity. Made from a black, semi-shimmering polyester material, it is richly lined with a midnight blue satin. This Wool Teutonic Cloak, with its distinctive cross, is based on those worn by the Teutonic knights. Our reconstruction is crafted in wool with a linen lining. This Teutonic Surcoat, replicating those worn by the Teutonic knights in the Crusades, carries the distinctive black cross by which these knights were recognized. This version is crafted in pure wool with a linen lining. One size fits most. This Teutonic Knight Cape is a matching hooded cape to the Tunic we carry. Our Rangers Cloak with Hood is a true adventurer’s garment. Rangers tend to be clever, cunning, and skilled in stealth and tracking. Our cloak is made of a shredded, soft ultra-suede. Features an attached full-size hood, lace-up neckline and underarm elastic to keep it in place during fighting. This Teutonic Knight Hooded Cape is made from white cotton. An imposing black velvet Teutonic cross is sewn over the left forearm area. A decorative leather snap closure fastens the medieval cape in the front, and a hood completes the design. Our Teutonic Knight Tunic (101596) completes the costume. This faux wolf fur mantle is made of white and black polyester and held in place with a carved bone button and loop. Features a simple drape design.